Taking notes in church can be hard. What do I write down? What is important in the lesson? How can I write and not miss out on what we're talking about? 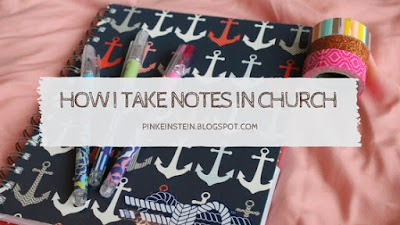 Well today I am going to show you how I take notes in church so you can get an idea of a couple of different ways to do it. The journal I use to take notes is this anchor journal from Walmart and I put my Burlebo knot sticker on the front. I like to use colored pens when taking notes to make it look fun. Sometimes I use multiple colors on one page and other times I just use one color. I like to use washi tape as well. 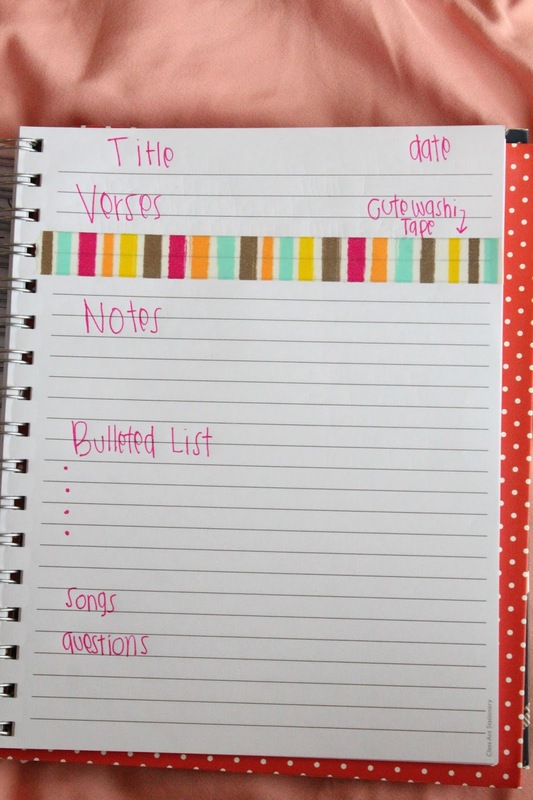 I use it to separate notes from different days that are on the same page and also to separate verses from my notes section (you will understand more as you read on). So this is my favorite set up for taking notes in church. I write the title of the lesson at the top with the date in the top right hand corner. I leave three to four lines for the verses that we are talking about and I add washi tape underneath the verses to look cute but also to separate the verses from my notes. A lot of times during our lessons during church we have bulleted lists so I add those below the notes. Below that I add the songs that we sang. After the songs I add the questions that we asked but also the questions we were asked. If that's too much for you to write and also pay attention at the same time you could just write the verses that you talked about and the date. So you don't waste the rest of the page, use washi tape to separate the different days. This page has 4/13, 3/23, and 1/27. Yes, I know they are out of order but 4/13 was the day I started using a journal for notes so after that I added in my notes that I took before then. Here is what my notes usually look like after church. Usually my Wednesday church notes take up more space than my Sunday notes because we don't have small groups on Wednesday. The left page is what typical Wednesday notes would look like. 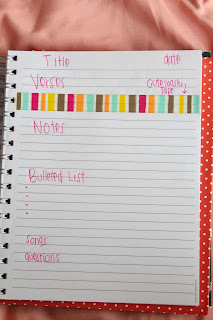 The top of the right page is what Sunday notes would looks like and below the washi tape is Wednesday notes. You can click on the picture to view a larger picture.